Mara Hoffman is an American fashion brand which has a variety of clothing and accessory options for women and children. Their designs range from bohemian dresses and swimsuits to classic and beautiful bridal dresses. There is something here for all occasions: whether you're looking to dress casually or a bit fancier. With Big Apple Buddy’s personal shopping service, you can now buy direct from the USA Mara Hoffman online store anytime, anywhere. The Mara Hoffman Cutout Dress, from Mara Hoffman's newest collection, is made of organic cotton and comes in this unique gradient stripe pattern. This dress features cutouts on the sides, which make a statement and help it stand out, as well as side pockets and a zip closure at the back. The handy side pockets will safely house belongings like your cell phone or a small wallet. The light colors of this dress make it a perfect fashion statement for these warmer months: sport it to a rooftop or a beach party and you'll seamlessly combine comfort and fashion. These simple shades also make the dress an easy one to pair with any shoes and some jewellery if you want to dress it up. The dress's fabric is hand-woven by artisans in India and is fully lined. With this number, you can beat the summer heat while still looking put-together and classic! Mara Hoffman also has plenty of fun, unique styles of bathing suits that will help you stand out from all the other beach-goers. The Mara Hoffman Slit Front One Piece in wheatfield print features a halter neckline with keyhole and cut outs at the side. This suit is a perfect option if you're getting sick of sporting the same old, plain black bikini or one piece. Do something different this summer and sport this fun and flirty design! And if the print alone wasn't enough to make this suit stand out from all the other ones you have, this one-piece's fabric contains SPF50. So, even though applying an extra layer before laying out in the sun is always a smart idea, this swimsuit was designed to give you a little extra protection for those hot summer days. Be smart, safe, and stylish in this one-piece! Mara Hoffman is a brand known for its bright, unique, and fun patterns. The Mara Hoffman Swing Dress is no exception: this flora blue print dress has a keyhole in the back and can easily be transformed from a casual, loungey dress to a more formal option with the right shoes and jewellery. Don't be fooled by the busy pattern: this is an extremely versatile piece that you'll find yourself wanting to wear all the time! And if you love the pattern but not the style of dress, don't worry--this pattern comes in plenty of other styles, as do many of the pieces at Mara Hoffman. This dress also comes in softer pink and grey colors, so pick whichever one best matches the rest of your wardrobe! 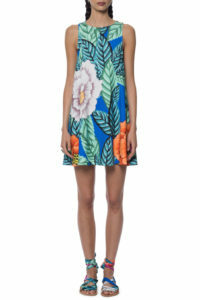 Unfortunately, the USA Mara Hoffman online store does not currently offer international shipping. However, Big Apple Buddy, your personal shopper, can help you buy products direct from the official USA Mara Hoffman online store and ship them to your doorstep, no matter where you are in the world. We offer international shipping to over 190 countries including Australia, Austria, Bahrain, Belgium, Bosnia & Herzegovnia, Brazil, Brunei, Canada, China, Croatia, Cyprus, Denmark, Estonia, Finland, France, Germany, Hong Kong, Hungary, India, Indonesia, Ireland, Israel, Italy, Japan, Kenya, Kuwait, Lithuania, Macau, Malaysia, Maldives, Mexico, Namibia, Netherlands, New Zealand, Norway, Oman, Pakistan, Portugal, Saudi Arabia, Scotland, Serbia, Singapore, Slovenia, South Africa, South Korea, Spain, Sri Lanka, Sweden, Switzerland, Taiwan, Tanzania, Thailand, UAE, UK and Ukraine. If you would like to buy from the USA Mara Hoffman online store, simply let us know which items you would like to order (by filling out the form on the right) and we’ll get back to you with a free international shipping quote within 24 hours!